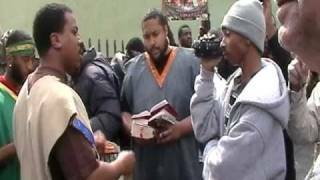 Yesterday I posted on here a dialogue a Christian (host of Back Pack Radio Show) had with the racist Black Hebrew Israelites, who thinks Jews are the true Hebrews. There has not been a lot of Christian resources and apologetics dealing with this movement, which has various subgroups with different beliefs. The following is my notes: First, I have practical apologetics pointers and secondly are some of my thoughts on what the Black Hebrew Israelites were saying. -Remember to be gentle and respectable even when they are not. – Talk to the less dogmatic member of the group when they are dominating loudly in the conversation. Does the Bible show that no one outside of Israel will ever be saved, not even one? Show me where in the Bible that “Ethnos” ever refer to land and not people? “ Line by Line” they say, but they haven’t done a good job of dealing with the verse within context. But is it BHI? How do they respond to other enthno-centric cults who claim this applies to them such as the British Israelites movement? Here this passage mentioned that the writing, “Jesus the Nazarene, the King of the Jews” was written on the inscription of the cross that Jesus was being crucified in. Gospel of Thomas is not part of the New Testament! Later the Gospel went to others as well as the book of Acts unfold especially with Paul the apostle to the Gentiles, which he described in his own word in Romans 11:13. Looking closely at Romans 11:15 means reconciliation of the world! Goes contrary to the example of Cornelius in Acts 10 and the conclusion Peter reached in Acts 10:34-35, and the Spirit’s miraculous confirmation of tongues in Acts 10:44-45. The passage makes no reference to Jews only in those physical location of nations. Term “nations” never refer to physical locations in the New Testament, but only to people. Burden of proof is on them to prove otherwise. 9.) Objection: Beat up other nations is premittable. Contrary to the Bible’s teaching such as 1 Peter 2:12, 2:17, 2:20. Text never said that the skin of Jesus was black. Symbolic language, do we expect Him to be Asian since it’s burning bright in verse 15 and therefore represent the “Yellow man”? With this kind of hermeneutics, do we expect Psalm 45:2-3 and Matthew 17:2 to prove that Jesus is white? 11.) Objection: You can’t be saved you don’t know your nationality. Where does the Bible teaches that? 12.) Objection: The world cannot sin, only Israelite can sin. The burden of proof is on them to demonstrate that ελλην refers to Jews that were Hellenized. The Greek word used to describe a Hellenized, that is, a Grecian Jew is ελληνιστης such as found in Acts 6:1. The context, it is unlikely to refer to Hellenized Greek because of the opposing contrasts such as the opposites of “free” vs. “slave, Male and female. These folks sound like a black version of the Christian Identity folks, from my interactions with CI folks. This kind only comes out by prayer- although a healthy Romans thumping couldn’t hurt, either. In my experience, their foundational belief -the one they will preserve at all costs- is racial in nature. Discussing soteriology and like subjects will only go so far. In the end, only God is going to get through to them. A good post, and one that is applicable (although there are no groups like this in rural ND, LOL). That statement is better stated than how I could have said it; I guess I’m so shocked by these guys I’m at a loss of words with their racism. I pray that the Lord will use our feeable attempt to share the Gospel to these folks (including finding this post online! ), and that He does the main work of God drawing them to Himself. Thanks for your comment! Really appreciate your thoughts on this movement. It helped ot clarify for me alot of the beliefs that they hold to. As I told you yesterday, I’ve never heard of this movement before you brought this to our attention. I really appreciate all the info you have given to us over the past few days. Lord bless you brother…. By the way, there seems to be no end to false teaching that we have to be aware of and ready to confront (in a Godly way). Thanks for helping us to be better prepared. You touched on a good point when you mentioned that there is no end to false teaching and the creativity of Satan to produce all kinds of weird combination of false beliefs together to form another false religious system. How much more do we need to remember to preach the Gospel and not just refute things! Thanks for the reminder!